Source: Greenwich Graphic. Saturday, September 25, 1909. Page 1. A Statistical Work Just Completed by Spencer P. Mead, Gives Data of Interest and Value. 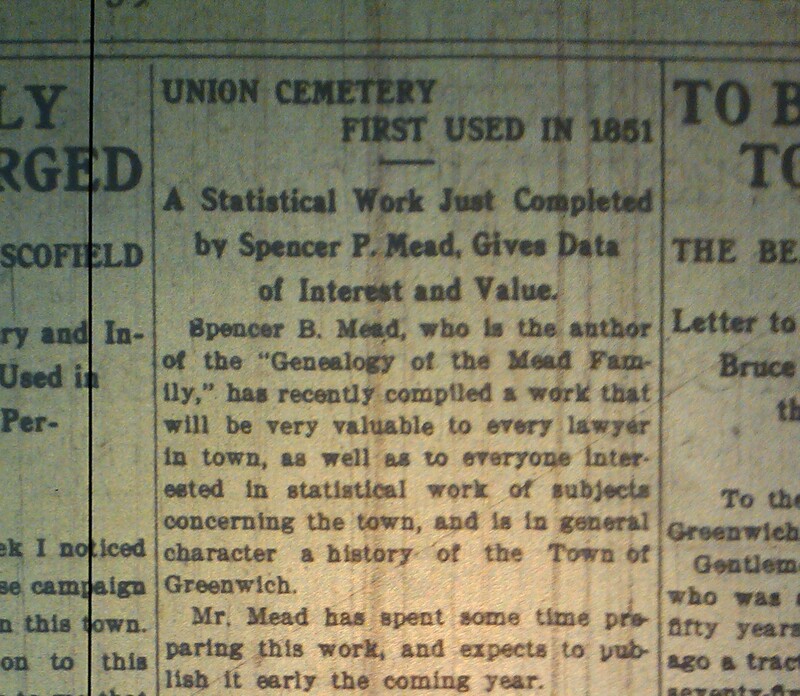 Spencer P. Mead, who is the author of the "Genealogy of the Mead Family," has recently compiled of work that will be very valuable to every lawyer in the town, as well as to everyone interested in statistical work of subjects concerning the town, and is in general character a history of the Town of Greenwich. Mr. Mead has spent some time preparing this work, and expects to publish it early the coming year. The book contains a list of the town officers from the incorporation of the town in1665 to 1910; representatives and senators from 1665 to 1905; and grant and titles prior to 1752; births, marriages and deaths from the earliest records to June, 1847, and an abstract of every known tombstone in the town, also the cemetery at Middle Patent, where many residents of the town have been buried. "Union Cemetery, at the corner of Milbank and Davis avenue, in the borough of Greenwich. The cemetery was originally called 'Burying Hill, and it was an old family plot. 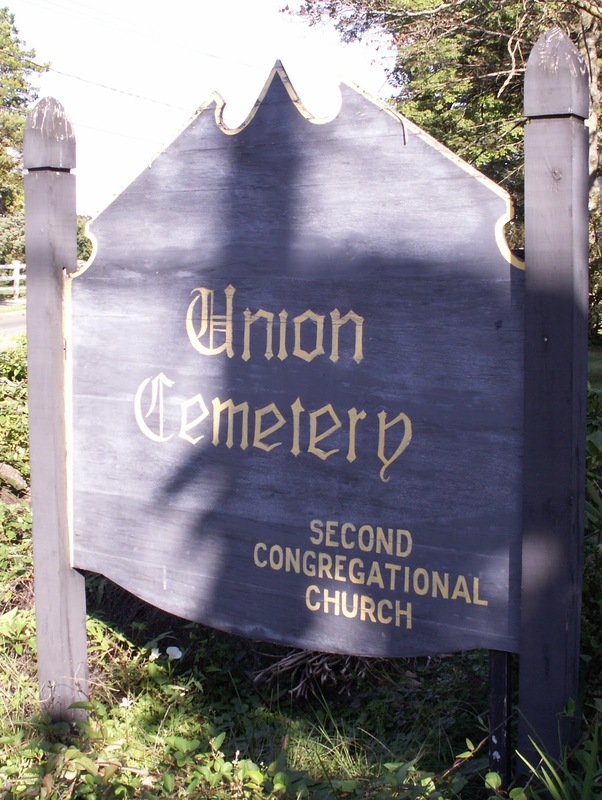 On the second day of November, 1851, Robert W. Mead, owner of the adjoining property, east and south of the old plot, deeded to the Second Congregational Society, now Second Congregational Church, three acres of land, and trust, nevertheless, as a burial ground, and for no other purpose, to be under the charge and superintendence of the committee of three persons, to be appointed by said society from among those of its members who are members of the church. "1st, Lot 23 is to be free ground for the internment of people of said town, and strangers who may die in the town, who by reason of poverty were unable to purchase a burial lot. "2d, The southerly part of said lot 23 is to be set apart for the internment of people of color, and such portion as it is deemed advisable to be sold in burial plots to people of color, at a rate not exceeding one cent per square foot. "3rd, Lots 12 and 13 are to be reserved for free ground, if required. "4th, The remaining 21 lots are to be sold from time to time, to any person or persons belonging to said town, at the rate of one cent per square foot, provided it does not exceed 1,800 square feet, said lots so sold not to be reconveyed without the consent of said committee. "5th, The proceeds thereof to be used in keeping said burial ground properly enclosed, and in decent order. The remainder of such proceeds should be paid by said committee to the treasurer of the American Home Missionary Fund. "6th, A right of way, 16 feet in width, is reserved in the westerly side thereof. "7th, The grass on the said ground is to be for the use of the pastor for the time being of said Second Congregational Society, at all times, to mow, but not to pasture, unless by consent of said committee."